When organising a Wedding or any other event it’s vital that you use suppliers that are of the highest quality and have reviews and testimonials from previous clients to back up any claims. On this page you will find countless reviews from Chris’ many previous clients from a huge range of different events so that you can feel completely comfortable that you are making the perfect decision when booking Chris to perform at your event. To see these reviews and more please visit Chris’ Facebook page. We had never met a real life wizard until we booked Chris for our wedding! Both ourselves and our guests were blown away by how amazing the magic was, it really kicked off our celebrations well, everyone is still talking about him now! We cannot recommend Chris highly enough we now need to arrange another opportunity to book him again!! Chris came to our wedding at the weekend and performed during the wedding breakfast. You could hear where in the room he was by the screams and claps coming from our guests. He left us amazed and baffled! He was a very friendly guy and an amazing performer. He added a lovely touch of magic to our Christmassy wedding. “After Chris’ outstanding performance at my wedding, it was a no-brainer to ask Chris to entertain at our workplace Christmas do. 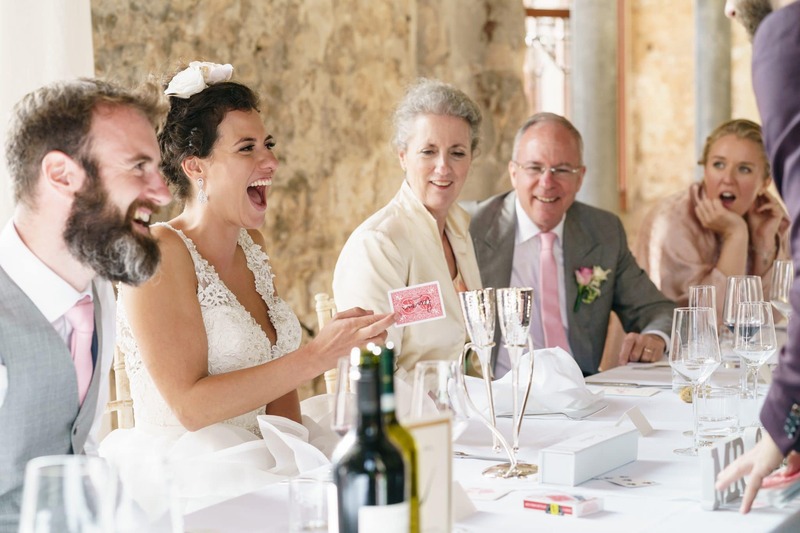 Along with close-up magic performed at the table and to small groups, Chris’ main performance captivated and mystified with a mixture of magic, mind reading and everything in between – all delivered seamlessly with style, fun and good few laughs too. We hired Chris for our wedding in July and he was incredible. Our guests absolutely loved him and it’s hard to put into words what he does as you have to see it to believe it. We are in the process of going through our photos and it is fantastic to see some of the reactions that have been captured!!! We asked Chris to come for a couple of hours whilst the canapés and pimms were being served along with the live music and old school fete games we had organised and he really got the wedding going and got groups of people together that had not met before. He was such a talking point and made sure he also came to me and Tim so we could have our own little show!! I hugely recommend Chris for any event- he was absolutely amazing. A huge thank you Chris for kick starting our truly magical day!!! Chris has just performed at our wedding, it was a very lively garden party, daytime guests back at 5, night time guests arrived at 530. Chris absolutely wowed every single guests and made the transition of everybody meeting who didn’t all know each other become one whole group. He did this by the quality and professionalism of his act. We and I’m sure all of our 122 guests would definitely book Chris again. He is a star and awesome. A really great guy and very talented. I would 100% recommend Chris for any party/wedding reception etc. Thanks Chris for participating in making my husbands party a memorable one. 40th Birthday Party, Lyme Regis. Just FANTASTIC!…..totally gobsmackingly brilliant! You were the talk of the night! A real professional with a real talent. Thank you Chris, it was a pleasure to meet you! We had Chris for our wedding on Friday 5th August. Updated on 2017-09-26T13:03:52+00:00, by chrispiercy.